Over the past few months I’ve been experimenting with guided math strategies in my classroom. One station in my classroom has been dubbed as the technology table. This table has been primarily used to differentiate instruction to improve students’ understanding of mathematical concepts. I’ve been using the tech table for the past few months with great success. There are five iPad apps that are used at this table. Unlike many math apps that offer only demo versions, I’ve found the below apps to be useful in the classroom. This app is the newest addition to my iPads for intervention list. This app emphasizes order of operations for upper elementary and middle school students. The game encourages students to use multiple dice to find the “target” number. A whiteboard is built into the game for students to work out problem. Progress reports can be emailed to the teacher for formative assessment data. This app is used to differentiate math instruction and assigned practice. What I like so much about this app is the variety of concepts that I’m able to individualize. For example, if a student needs additional work on the concept of time, then I can setup the app to only give questions related to time. Questions first appear simple, but then become more challenging as questions are answered correctly. If you prefer, Splash Math will send you a weekly update indicating the progress of each student. This app is used to improve computation fluency. This interactive app has a quick tutorial to teach students how to move the main character through a variety of mazes. Students control a space vehicle that inevitably encounters an octopus type of creature. Students must answer computation (addition, subtraction, multiplication, or division) questions to defeat the boss. Factor Samurai is an app geared towards emphasizing the concepts of prime and composite numbers. Basically, numbers fly into the air and the student is expected to slice the composite numbers with their fingers. If it’s a prime number, then the student leaves the number alone. Some composite numbers can be sliced multiple times. ScootPad can be used to individualize practice in your classroom. I’m able to assign specific students certain Common Core objectives to practice. After a student completes an assigned section, they are allowed to see all of the correct answers. Scootpad will also send the teacher a statistical report of the progress made by individual students. I’d also like to note that Scootpad can also be used on a PC or MAC. I’ve been asked by a number of people what apps I would recommend to an elementary teacher. I decided to create a quick chart to help. 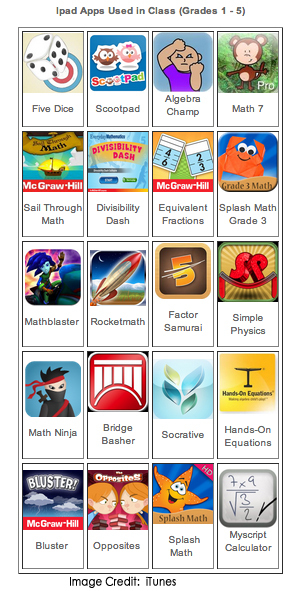 So, what math iPad apps do you use in your classroom?